Following are river locations where the public can buy fresh salmon in season. Days, times and salmon availability vary. Fresh Indian-caught salmon is sometimes available at farmers markets in Portland and other communities along the Columbia River. Learn more about Buying Salmon. 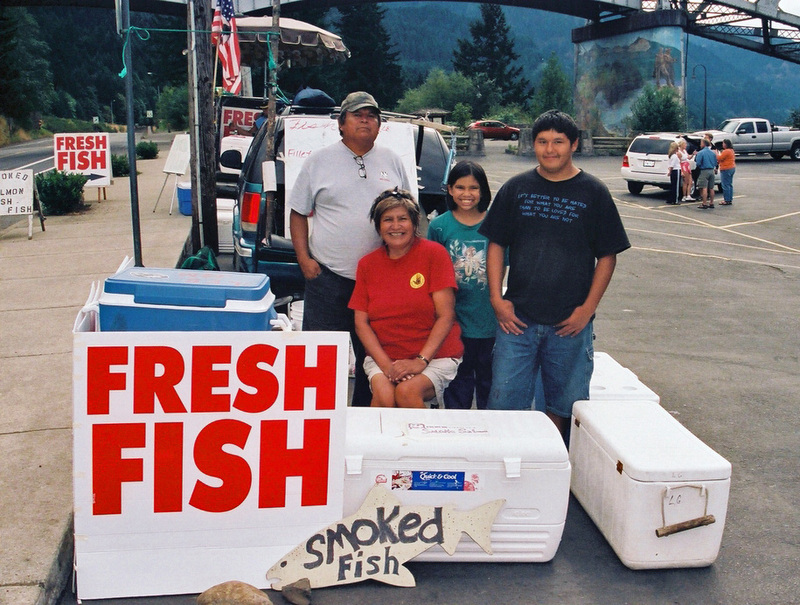 The Umatilla tribal member-owned Brigham Fish Market (681 WaNaPa St, Cascade Locks, 541-374-9340) sells fresh Columbia River-caught salmon and other fish in season and packaged fish and other food items throughout the year. Over the bank sales locations at Cascade Locks include the parking lot at Char Burger, under the Bridge of the Gods, Cascade Locks Marine Park and “Indian Camp.” Look for signs indicating salmon sales. On both sides of the river near the Bridge of the Gods are places to stop and see Indian fishers dipnetting from their traditional wooden platforms or scaffolds. The toll bridge is named for an Indian legend that tells how a natural land bridge spanning the river was destroyed by the volcanic eruptions of two powerful warriors, Mount Adams and Mount Hood. The two were competing for the affection of another mountain, now Sleeping Beauty, west of Mount Adams. From Vancouver, take Highway 14 east toward the Bonneville Dam. Go past the Bonneville Dam Visitor Center to the Ft. Raines fishing access site, about one mile west of the Bridge of the Gods. The site includes a 1.5-mile hiking trail that passes a Cascade village site and one of three nearby military forts. Upstream was a prime fishing area, the Great Cascades, a series of spectacular rapids flooded by Bonneville Dam in 1937. Cascade Indians and other Chinookan-speaking peoples lived in cedar plank homes in small villages along the Columbia from the mouth upstream to The Dalles. Over a decade before Lewis and Clark visited theses villages, a smallpox epidemic killed about half the Chinook peoples. In an 1856 military action, the U.S. Army wrestled control from the Cascade Indians. Descendants of the various Chinook peoples are today members of the Warm Springs, Yakama, Grand Ronde and other tribes. Several miles east, Cathlakaheckit, another Cascade village, was excavated then destroyed in 1979 to make way for Bonneville Dam’s second powerhouse. Excavated items are displayed at the Washington Shore Visitor Complex. Underwater salmon viewing is at the same facility. Fort Cascades is about five miles west of the Bridge of the Gods on Highway 14. To reach the Lone Pine sales area located in The Dalles, Oregon, take I-84 to exit 87. Look for signs indicating salmon sales. View the remains of an Indian Shaker Church, other weathered buildings and fishing platforms along the river near the Shilo Inn. The Center tells the story of the Gorge’s Indian tribes, Lewis and Clark and other explorers, and early settlers at the end of the Oregon Trail. Includes photographs and film of the Celilo Falls fishery. To reach the Discovery Center take exit 82, turn right onto Highway 30 for 1.5 miles, right onto Discovery Drive to the Center. From Highway 14 at Roosevelt, turn toward the river onto Roosevelt Ferry Road. Proceed to the boat launch and the Treaty Fishing Access Site. An aptly named stretch of river along Highway 14 between John Day and McNary dams. When Lewis and Clark passed through this area in October 1805 they had to ride through many difficult rapids and around huge boulders now inundated by dam floodwaters. They also saw numerous Indian camps and villages “near each other along the shores on both sides of the river.” Native people were here for the fall fishery. While today’s Columbia River is more like a series of lakes, for thousands of years, the river was laced with rocky rapids and deep pools that provided good fish habitat and good fishing. Other salmon sales locations may be found along the river. Look for signs along major highways and roads. Fish are marked SCARCE if a tributary fishery (usually the Klickitat River) is open but not the main Columbia River. Availability is quite limited and can only be determined by actually driving to the tributary. Walleye, yellow perch, bass, catfish, and carp are occasionally for sale in very small numbers. A fresh salmon sales station set up beneath the Bridge of the Gods in Cascade Locks. Tweets by @ColumbiaSalmon Follow @ColumbiaSalmon to get the latest Columbia River Indian-caught Salmon sales information and news in your feed.